Whoa, can you believe it? 2018 is drawing to a close. I don’t have any more big unicycle plans until January, so this is the perfect time for me to sit back and look at what I’ve done this year. Where I’ve gone. Who I’ve adventured with. All those good things. From Liechtenstein to South Korea, Sweden to Morocco, here is a summary of my unicycle travels in 2018. Author’s note: This article features some photos from some very talented people I know. I highly recommend you check out the work by Lara Beins (Instagram) and/or Konstantin Höhne (Website, Instagram), since I think their pictures are super cool. Additional thanks to Keun Hong and the Alatau Trail Fest committee for sharing photos from events. The winter edition of the Extreme Unicycling Competition (EUC) is the chance for us European riders to finally see each other after a few depressing months of winter. We converge onto a hall in Köln, sleep on the floor and ride and socialize and just have a good time. I competed in Trials (not very seriously, my goal was to complete one line) but focused more on supporting the organizing crew. Data entry, clock management during flatland battles, basically whatever odd jobs needed to be done. Good times all around. Traveling with the uni and a Club Mate. Photo credit: Lara Beins. Originally meant to be a unipacking trip, this turned into a traveling-with-my-wheel trip when I realized that I needed to work while I was there. But I still saw several really cool towns (Marrakech, Imlil, Chefchaouen, and Taghazout) and was able to share a bit of one-wheeled love with the people I met. I had a wonderful time in the country, and I look forward to seeing more of it some time in the future. It’s becoming a tradition, one that I love, to travel in the spring to the southwest states in USA and meet up with muni buddies to ride the awesome trails there. Red rocks, sparse yet green bushes, and creepily blue skies augment good times with good people. This year, I traveled with Emma, Benoit, and Adam (Team Freshavocados) to Fruita, Colorado, and Moab, Utah. Talk about non-stop funtimes. I am so fierce. Ha, not. I owe Lasse a huge debt of gratitude. In early May, he, Katrine, and I decided to go on a muni weekend during a Danish 3-day holiday weekend. With no concrete plan, we piled into the car and drove to Sweden, where he said “there might be a cool bike park and we should check it out.” Turns out, riding downhill at Vallåsen was super fun. So fun, in fact, that a few months later we took a group of Danish muni riders with us and we went again. Practically outnumbered the two-wheelers on that day. It was great. A muni event that occurs once in awhile, Elsbet was one of the highest-quality muni weekends I have ever attended. Turtle, the organizer, outdid himself. A great camping spot, tasty food for all meals, shuttles, live music, and scores of riders who showed up. Not to mention…the trails and views were, of course, fantastic. Can’t wait until the next one. This was the first Unicon where I stepped up from power volunteer to an actual organizer. I served both as the International Unicycling Federation Representative and the Volunteer Director, and I also tried to support the event directors for Jumps, Trials, Street/Flat, and Muni to make sure that they had everything they needed for their events. It was exhausting, sure (there was a string of 4 nights in a row where I got <5 hours of sleep), but it was energizing at the same time. Also, I learned so much about project management, I feel ready for anything at work now. Ha. And of course, in between, I got to compete in muni and enjoy the wonderful feeling of the pure, unicycle spirit. Early in the year, I messaged my awesome friend Becky and said we should ride together sometime. She agreed. We picked a weekend for me to visit her in Harz…and suddenly there was a muni weekend with over 20 people attending. How. Awesome. We rode a downhill park on Saturday and had a fun-filled XC tour on Sunday. I was so happy to see Becky’s home trails, and I hope I can go back and visit sometime again soon. The entire trip to Kazakhstan was like a dream of a dream. For several days, I was offered the absolute best of hospitality and enjoyed the cozy friendliness of unicyclists from Russia and Kazakhstan that I had either never met or only seen at events. I learned to read Cyrillic. Taught an 11-year-old girl how to leg wrap. Rode in a XC competition in the Alatau Mountains. Learned to make kasha (Russian porridge). 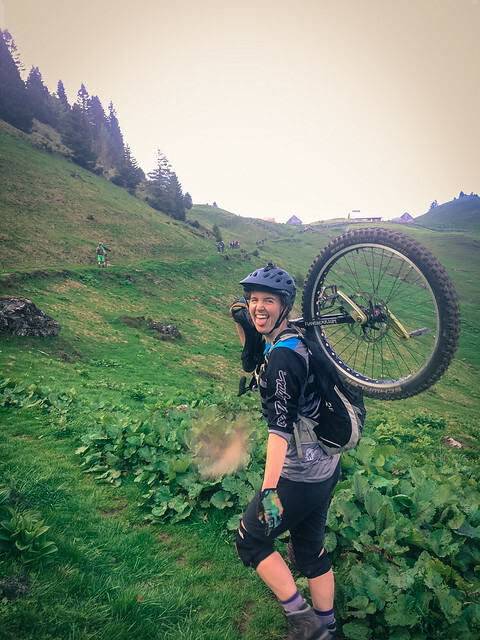 But most importantly, I’ve developed a connection with the unicycling community in Kazakhstan and I’ll be able to watch the group grow and develop in future years. I can’t wait to see where it goes. Oh my, you are incredible!! What vistas you have seen. What great people you have met. What an exciting and adventuresome life you are leading!! I am so happy for you that you have made your life such a success. WOW!! I’m just still so happy you chose me to be your Mom!! Love you SO SO much!! You go girl! Cannot imagine traveling to that extent. Live your dream, but don’t break anything. Glad to see you protect your head and joints! 😉 Sandy Linhart, La Crosse WI. What protection do you recommend? Hi Sarah, good question. I only used shin guards when I first started riding, since I was worried about bashing my shins on the pedals. Now, I will use helmet, gloves, and knee pads when riding muni. I add shin guards as well if I’m trying trials-y stuff. For freestyle practice, I don’t use any protection. Hope this helps! What a year, Jenni, and a lifetime of memories! So glad you’ve got an adventuress and indomitable spirit! I can’t wait to hear what you’ve got in store for 2019.